Loading a horse is often a trying experience for everyone involved, particularly your horse, and if you frighten him into going into the trailer, every time thereafter it will be all the more difficult. On the other hand, every time it is a positive experience for your horse and you, it will be even more positive next time, unless the driver is careless or the trailer unsafe. It is therefore always worth the time and effort to take as long as necessary to do it properly. As well as the fact that a horse is quite capable (as most of us know) of simply refusing point blank to go in, and then we have made the recovery process much harder for him and for ourselves. The following plan outlines each important stage of loading a horse, covering the majority of situations. It is important to remember that it is not easy, even for the most experienced horse-people, to judge whether or not a horse is frightened, or more correctly, the degree of a horse's fear. In my experience, if any horse refuses to do something, there is fear in that horse to some degree, at some level. Even the horse who lacks respect is still fearful about putting his trust in you. Dealing with and hopefully resolving this fear is the most important consideration in any training scenario, and successfully loading a horse is as important a training achievement as a correct shoulder-in or jumping round. This is important to understand because sometimes you can improve the situation in some way, and even if you can't, just the fact of recognizing the issue can help the horse to accept it. This is only usually a big issue if your horse is traveling alone. It is important for us to realize that horses in their natural environment are not often alone. It is one of the biggest demands you can make of your horse, and one which will put a spotlight on how much influence you really have over your him i.e. how seriously he takes you as his leader. If he trusts you as his leader, then he will follow you into the trailer despite having to leave the other horses. The first step you can take towards achieving this trust is to be sure that you do actually care about how your horse feels, and to always do your best to make sure he feels secure and happy in his life (See Horse Health). If you do this, then the few times you do have to ask him something which is hard for him, he will do his best to please you. Horses are usually frightened of traveling because of bad experiences in their past, including accidents they have been involved in, and having been the victim of careless driving. Loading a horse who has been traumatized in the past requires a lot of patience, and no fixed time-scale. Distinguishing between horses who are very frightened and those which are nervous is not as obvious as can be thought. Often really scared horses appear stubborn because they have hidden away inside themselves and are having a kind of silent panic attack. It helps to know your horse and his personality, and also to be prepared to admit to the possibility that he might be panicking. It is well known that horses can sense the energetic vibration of structures. 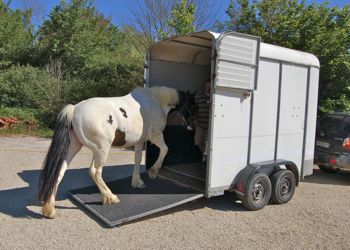 If you are loading a horse who has never been difficult before, and has suffered no bad experience that you are aware of, and he suddenly decides it is a very bad idea to go in, it is certainly a good idea to check the safety of your trailer. This might be the solidity of the floor and the ramp, and the tyre pressure. The consequences of an accident are usually a lot worse than not getting to the show on time. Of course your horse might also be completely unaware of such things, so unfortunately he isn't a reliable problem detector either! Often it is necessary to travel horses which are half-wild, if not completely unused to people. Sometimes their natural fear of people is exploited to allow them to be channeled into a lorry or even a trailer. This is definitely a last resort scenario, and not really relevant to our subject, where we are talking about establishing a mutually beneficial rapport with a horse. If you have any means at all of controlling your horse with a head-collar, such a fear of humans in a horse can be addressed. Fear of people can also manifest as lack of respect for people, which can also be addressed and resolved to some extent when loading a horse in a trailer in the same way as when schooling in the arena. Probably the commonest sign of mistrust of people shows up as a simple lack of willingness to go forward when you ask. It doesn't take any horse long to add up a chain of events, and if he doesn't enjoy the object of the journey, for example competing in a situation where he is not ready physically and/or mentally, then he is soon going to add up the fact that the trailer is the main part of the conspiracy against him. It is often a process which, when overlooked, starts as a refusal to enter the arena and can end up as a refusal to be caught in the field. If refusing to load into the trailer is a result of a problem further down the line, you should be able to tell by your horse's comportment in other ways. Such as if he is much more tense at the destination than at home, if he is only difficult to load when he's plaited up for a show, or when it is early in the morning. There are many factors which must be considered, the most significant of which being your intuition. If you really want to understand what is going on, it will become clearer and clearer over time. He senses your anxiety and associates that with the trailer. This factor is in general much more powerful than we imagine whether loading a horse or riding at a show especially if our horse does actually trust us as his leader. When the leader is worried about something, there's no way he's going to go anywhere near it! It is a very helpful exercise in any case to learn to analyze your own emotions, and is especially important when you are training difficult horses. You have to be able to distinguish what is you and what is them, and whether you are resonating with him or him with you, or both. It is normal to be nervous before a competition, but in all situations as a leader you have to find a way of changing the emphasis of your state of mind. Often this happens naturally in the ring because your mind is taken up with the experience of what your doing. It can be more difficult when it comes to loading a horse because you are also worrying about getting there in the first place. Staying conscious of your anxiety until it resolves or changes. Imagining you are having the chance to compete in the Olympics works for some people. On the other hand Imagining all is lost before you even start and you have nothing to lose often helps others! Remember you horse relies on you for his peace of mind and you are his protector. In this case you might tell by his general comportment on that day, that he is a bit dull in himself or sweating more easily etc. If he is refusing to load out of character you might suspect he isn't feeling great. Always investigate if you do have doubts because traveling requires a lot of energy and if he is unwell it will aggravate his condition to travel any distance and he may hurt himself if he gets too stressed. There is one effective procedure for loading a horse which will address and ameliorate the majority of the issues described above. It is a process which is based on the concept of channeling. To be as sure of success as possible, make sure, as far as you can, that you have the following attributes. These attributes are in fact your channeling system. Everyone knows that water will run wherever there is a gap for it. As when straightening a horse, your success, when it comes to loading a horse, depends on the lack of gaps in your system. This is not quite as simple as it sounds because your channeling system is not physical but energetic, and it relies on your intelligence and intuition to actualize it. The first attribute you must possess is patience, and the other is strength of will. You must be willing to outlast your horse's concentration span - which depends entirely on the individual horse - and you must have a stronger resolution than him to succeed. You will never be stronger than a horse physically. That is why it doesn't work to train horses by force. On the other hand, you can, if you choose, be stronger mentally. In fact you must be stronger mentally if you want to be a successful horse trainer and rider. These are the requirements of a leader in all circumstances. It is important not to let yourself feel frustrated or angry because this is a fear-based state of mind, and will not give your horse courage. If your horse is in the habit of pulling away from you and/or you are not strong enough to hold him in an ordinary head-collar, then use a fine rope one. It is better to avoid using a bit, if possible, or any other kinds of chains and ropes in the mouth, because the horse's mouth must be protected as carefully as possible. Rope head-collars with any kind of studs at the poll are a very bad idea as the nuchal ligament can be damaged, sometimes irreparably by the force of the horse coming against it. In fact, in a case where a horse is frightened to the point where he uses his strength against you violently enough to make it necessary to control him with a bit or other kind of gadget, you are better to create a closed area around your trailer which he definitely cannot breach. Using a rope head-collar, don't kill yourself trying to stop him when he pulls away, let him go - and simply go and get him back and present him with the same situation he ran away from. You might have to do this fifty times, maybe more depending on how entrenched his fear-based habit is, but sooner or later he will realize the futility of hi actions and find the courage to consider what you are asking him. A horse will always learn what his actions lead to, as long as he is shown enough times, so you are not 'letting him get away with it' when he pulls away, because he has gained nothing. Unless of course you decide you need a cup of tea halfway through, and he has a nice rest! It can take many years to develop you leadership capacities to the point where the solutions to a problem seem to become instinctive, so don't worry about it if things don't go right, just spend a bit of time working out where things went wrong and start again. Horses are actually just as receptive to the right training as the wrong, it is just that the right training is more difficult to put into practice. It is a good idea to make sure before you approach the trailer itself that your horse is leading well. You can do a few circles, asking for your horse to walk on willingly, while you stay at his shoulder, using the end of the lead-rope to give him a tap if he doesn't respond. Also expect him to stop when you stop, and to respect your space and move away when you move across. If he is lazy you will need to raise your vibration a bit and transmit the energy to him, and if he is tense you will need to lower your vibration and stay calm and patient. Once you feel he is listening to you, make a nice big loop and approach the ramp straight. Making a good trajectory is important because you won't be turning away again to straighten up again. If you turn away, you have weakened yourself in the eyes of your horse because he will read this as hesitancy on your part. That you are unsure whether you want to go in the trailer or not. You must transmit the necessity of going into the trailer when you are loading a horse. You are not messing around, he must accept that you are serious, and you make that decision in your mind. Turning away is an expression of ambivalence. As long as your horse is seeing what is in front of him, and is interested in it, then it is best to let him take his time. Normally he will want to smell the ramp and inspect the structure, and it is important to let him do that undisturbed. If he refuses to acknowledge the situation you are presenting him with, then you have to channel him back on track. The secret to loading a horse into a trailer is as simple as presenting the horse with what you want, and channeling him until he reacts in the way that you want. If your horse looks away, you bring his head back round. If your horse tries to pull away you keep him facing the trailer, even if he runs right back, you keep him on the path which leads to the trailer. Don't try to stop him going backwards if he is going straight and he is really resisting, it won't speed things up, and such a situation can damage your horse's neck. He will normally walk back to the point he reached before quite easily once he sees that he can't turn away. If your horse moves sideways off the ramp, or around the ramp, you push his body back round until he's facing the ramp straight again. Never turn him away, even if he puts himself in a really awkward place every time, he knows what he's doing, and if you insist that he yields his body to you until he is straight again, then he will eventually stop evading. You might have to push him back round fifty times, but every time he learns again that you are the leader. If he plants himself into a position and refuses to move, then you put a slow but continuous pressure on the lead-rope, and you wait. No horse will put up with such a pressure forever, and when he does move he receives the reward of freeing himself. If he walks forward that's great and you praise him and after a minute of reward you ask him again, and repeat the procedure. If he resists further by throwing his weight back or rearing, you wait until he has finished, make sure he's straight and re-impose the pressure as soon as he is calm. Horses usually change their evasions fairly quickly. They might go through five or six different means of escape. The important thing is that you don't change what you are asking. Of course you have to respond quickly, calmly and effectively to each different evasion. Sometimes you are strong, sometimes you are very gentle, but it is only if you don't change that the horse will change i.e by yielding and going into the trailer. If you do change your approach constantly i.e yield to the horse, by for example, offering food, putting a lunge line round the horse's hindquarters, offering a different kind of food etc. then the horse will be freed from having to confront the issue. Following this procedure when loading a horse often produces the result you want quite quickly, especially with horses who are just a little anxious or unsure. On the other hand traumatized horses will also respond slowly but surely, and every time better. Working with particularly fearful horses is particularly rewarding, if the handler can become aware of the fear in the horse. This recognition gives the horse a chance to recognize the fear in himself, and therefore find the courage to trust people in a way he has hidden himself away from for often a very long time in his life. It is also when you can develop this ability to sense your horse's feelings, that you will access your innate ability to become aware of the right solution to a particular problem. Recently when helping loading a horse who really didn't want to know when we presented him with the trailer, I had such an experience. He had the appearance of a stubborn horse who wasn't really scared, just being difficult. I started to concentrate more on his energy and gradually became aware of the terror he was feeling about going in. It was the equivalent of asking him to step off a cliff, and his only defense was to plant himself there and refuse to move. When I became aware of this terror, I commented on it, so that everyone would be able to recognize its existence, and in this way share the horse's experience, and lower his defense. After this he started to be more aware of the situation, to look at the trailer, and consider the idea of going in more resolutely. Then I felt that it was very important that I make myself very small in front of him, because, in fact, he had been badly treated by people, and he was frightened both of being dominated and of the trailer. I crouched right down and stayed aware of his state of mind, and gradually he made his way into the trailer. In his case because his defense was to plant himself, there was no need for the other forms of channeling. It was crucial however that his true feelings were recognized, if we had fought with him for being stubborn he would have been further traumatized. This example does highlight the importance of developing intuition when working with horses and not trying to impose some kind of mechanical 'system' in every case. On the other hand there are fundamental principles when working with horses such as yielding and channeling, the understanding of which will open many doors for you in your horse-training experiences. Have a look also at The Whole Horse newsletter back-issue: Loading A Horse: problems and solutions.